Rear flank downdraft coming around hook echo region of supercell to the southeast of Floydada, TX. 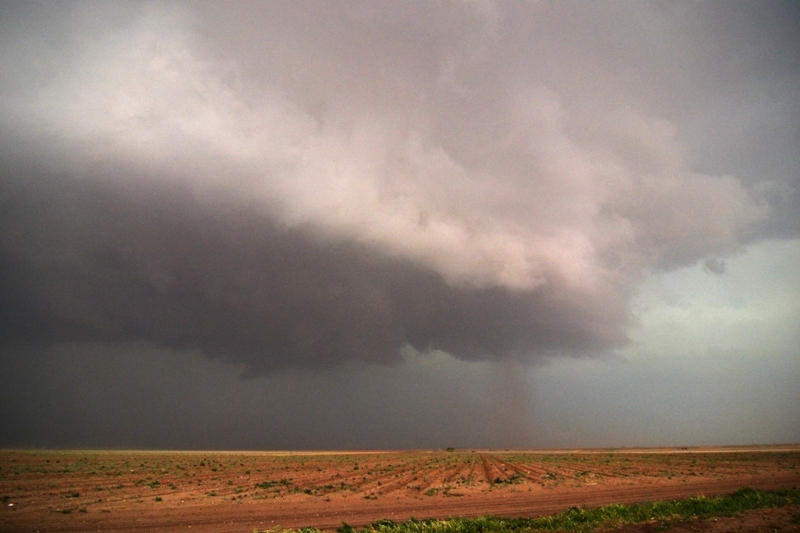 Another shot of the dirt being blown around the hook echo region of the supercell. Lots of dirt being blown around and a lot of motion/rotation occurring on the tornado warned storm southeast of Floydada, TX. A couple of elongated inflow tails into the base of the storm. 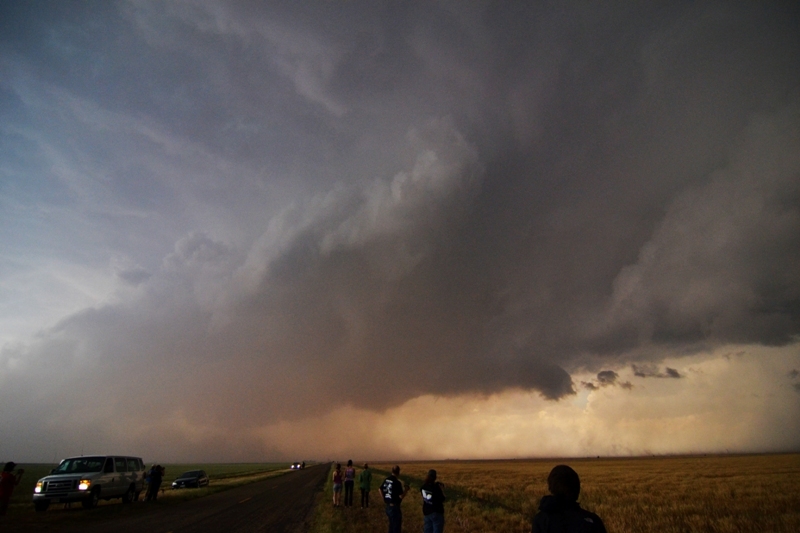 Main core of supercell to the right. Another structure shot just to the right of the photo taken above. Looking directly at the hook and the forward flank downdraft. Interesting area of rotation was occurring just above and to the right of the road. Could have been a funnel attempting to form but shielded by a lot of blowing dirt. 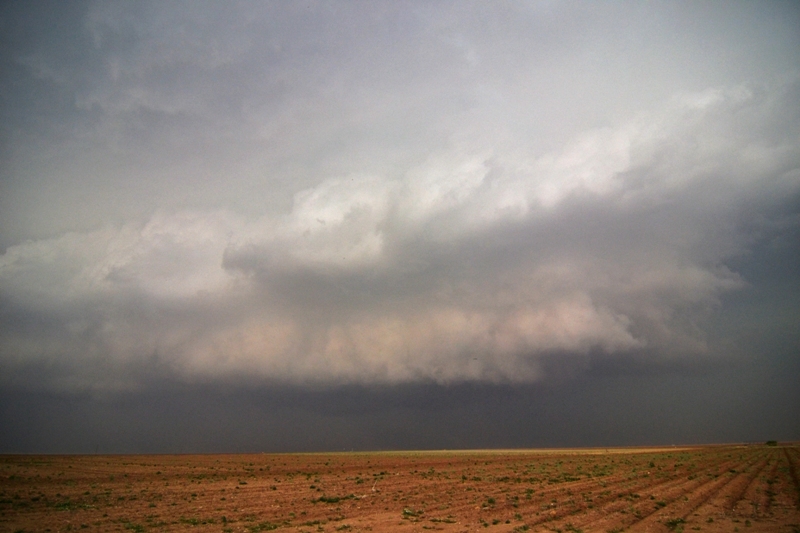 A shot of the base and inflow on the southeast side of the supercell to the north of Crosbyton, TX. Wall cloud forming north of Crosbyton, TX as storm is tornado warned. View to the right of the image above, looking at the east and southeast facing sides of the storm. 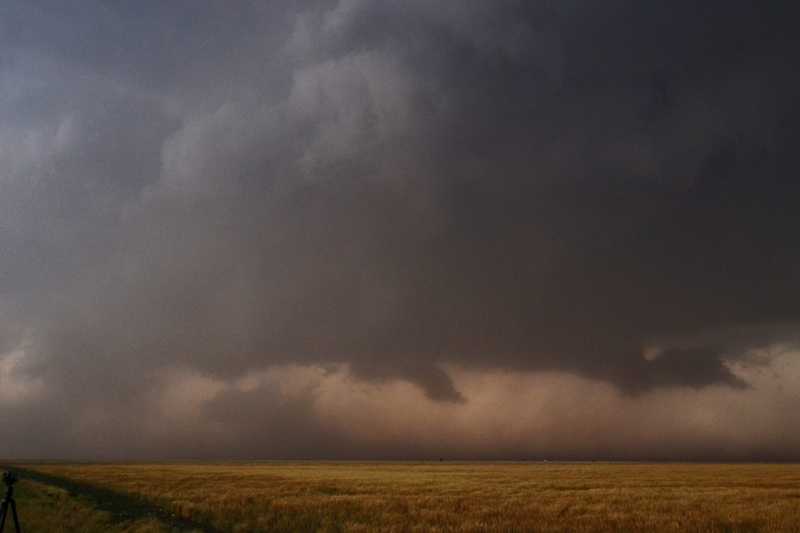 This turned out to be a fun chase day full of Texas storms and dirt. We started the day in Amarillo after eating at the Big Texan restaurant the night before, so our bellies were full of steak! Model guidance, especially the HRRR, was indicating two plays, one with supercells developing from a Lubbock to Childress line and then a second wave of storms near Amarillo later in the day. The set-up included a weak surface low to the west of Amarillo with a trailing dryline due south along I-27 and an outflow boundary from a morning MCS draped southeast of the surface low through northwest TX. Temperatures were heating up into the lower 90s in the warm sector south of the outflow boundary and ahead of the dryline, while dewpoints were mixing out into the middle 60s. The concern was the larger temp/dewpoint spreads that would result in high-based storms initially and lower tornado potential. 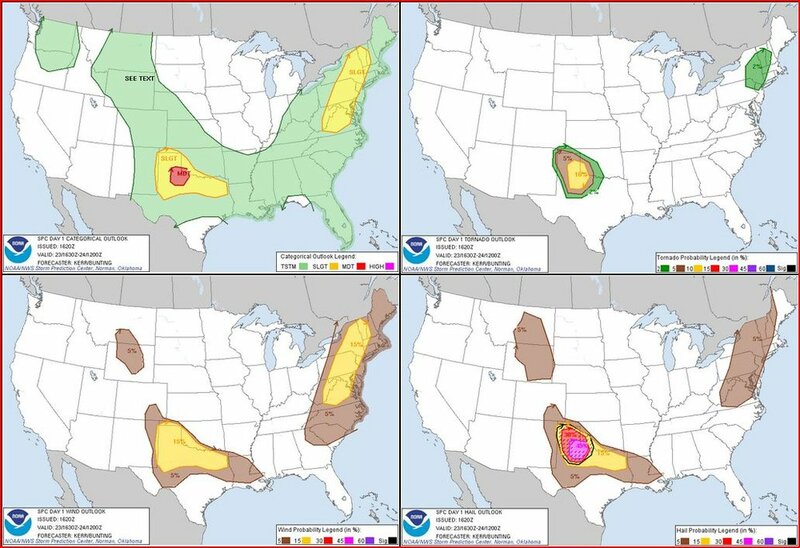 However, steep lapse rates, large CAPE, and sufficient deep layer shear existed for supercells and a threat for very large hail, as well as tornadoes as LCL heights lowered. Our general target was the Matador area, and the plan was to proceed to Tulia and then decide whether to head east toward Turkey or further south and then east towards Matador. Before we made Tulia however, the first storm of the day fired north of Floydada as a tornado watch was issued at 1:40 PM CDT. This storm appeared firmly anchored to the boundary, barely moving, and there were already reports of possible landspout tornadoes before we could get a visual of the storm base. With the storm not moving there was no point in going east, so we proceeded south to Plainville, then on to Floydada to intercept. It was apparent as we got on the storm that it was going to be a dirty mess! There was dirt flying around all over the place and we saw several gustnadoes as we passed south of the hook echo of the storm and stopped in perfect position to see if a tornado would develop. This was one of those situations that you could look at the radar image of a storm then look up and really see all of the features laid out in front of you. To our north the inflow was streaming into the storm right to left, but just west of us where the hook wrapped around the meso was spinning left to right. The storm looked like it would tighten up and produce just to our northwest several times, but could never get it done. The front flank core began approaching us as it wrapped around the hook and the storm was showing large hail on radar so it was time to bail, get south, and into position for the next attempt. We went south past Dougherty on farm roads, watching the storm cycling while pushing a huge plume of dirt out in front of it to our west, eventually stopping near Crosbyton. The storm by now had broken away from the boundary and was heading south, and after one last try to produce a wall cloud, became a dirty, outflow dominant mess. We stopped in Ralls for a break, and then headed north to get ready for round two up near Amarillo. By the time we’d reached Floydada again, the show was already beginning north and we bee-lined it to I-27 to head back to Amarillo, all the while getting buffeted by outflow winds from our original storm to our east. The storms to the north developed quickly and we could see a big overshoot over the updraft of our target storm. The storm merged with another cell as it developed, which bought us some time, then split, which bought us more and soon we were close enough to get ready to chase it. 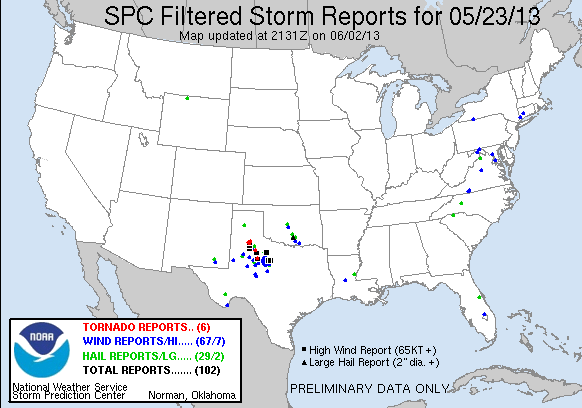 The atmosphere had become pretty mixed by that time though, and the storms didn’t recover from the split as expected. In fact, the right split died almost immediately! We chased the left split, which was now traveling to the northeast north of Amarillo, for a bit but that storm also collapsed quickly and we called it a night, conveniently within ½ an hour of the hotel. 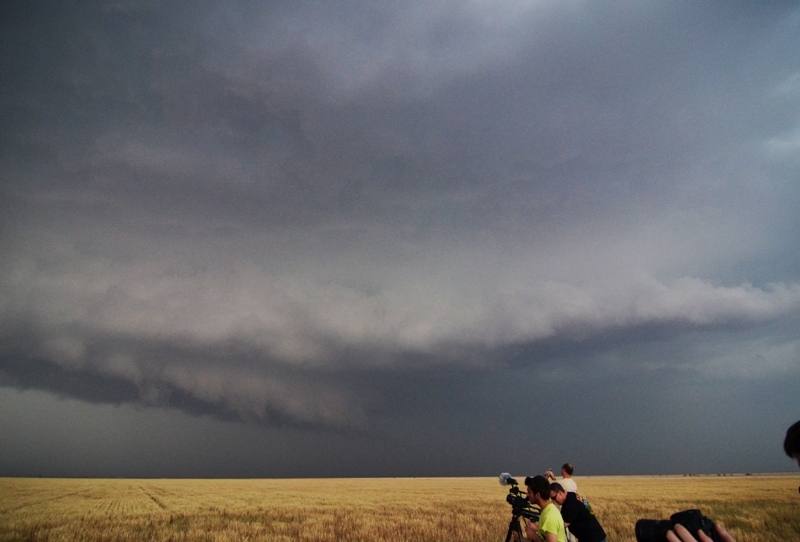 Overall it was a fun chase day with a great supercell that almost produced a tornado.